You don’t need to be a geometry genius to figure out the meaning of these words. In fact, almost all Filipinos can draw these shapes even with eyes closed. (In case you’re a foreigner, the above names correspond to square, circle, rectangle, and triangle, respectively). 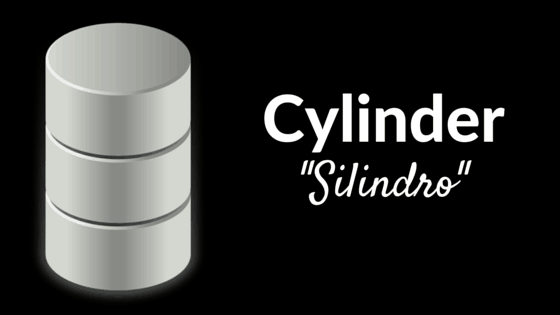 But what if I ask you to draw a silindro? Do you know what a tagilog look like? How about a gasuklay? Apparently, there are more things to learn about shapes and their Filipino equivalents than you thought. 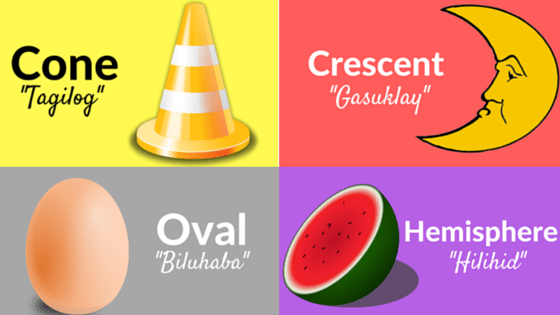 This list gives us a rundown of some familiar shapes and their less familiar names in the Filipino language. 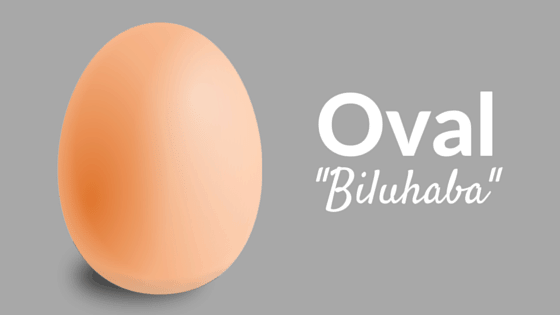 If something is oval, it means it has the shape of an egg. In Filipino, you can either use obalo or biluhaba (from the root words “bilog” and “haba”). The difference lies on how they’re used: Obalo or obalado is a noun (pangngalan) while biluhaba is a word used to describe anything that is oval-shaped (hence, it’s an adjective or pang-uri). Obalo (noun): Gumuhit si Nena ng obalo sa pisara (Nena drew an oval on the blackboard). Biluhaba (adjective): Ang salamin ni Nena ay biluhaba (Nena’s mirror is oval). Other alternatives you can use are habilog (haba + bilog), talinghaba, tighaba, and tulinghaba–all of which are adjectives. Dictionary definition: “May hugis na pabilog na medyo pahaba, gaya ng hugis ng itlog” (UP Diksiyonaryong Filipino, page 170). 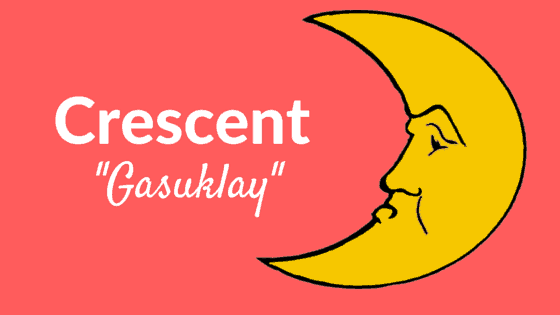 The emblem of Turkey and Islam, crescent is the name given to the visible part of the moon when it’s less than half full. Gasuklay is the Filipino term for this shape, supposedly because it resembles the shape of a comb (suklay). Dictionary definition: “Anyo ng buwan sa una o huling quarter na tila suklay ang hugis; anumang may katulad na hugis” (UP Diksiyonaryong Filipino, page 391). In geometry, a cylinder is defined as any solid object with two ends that are both circular. Aside from silindro, you may also use silinder as the Filipino translation of this shape. Dictionary definition: “Isang solidong bagay na may pabilog na anyo at mga gilid na tuwid at magkakapantay” (UP Diksiyonaryong Filipino, page 1138). The Pyramids of Egypt probably best illustrate what this shape looks like in real life. 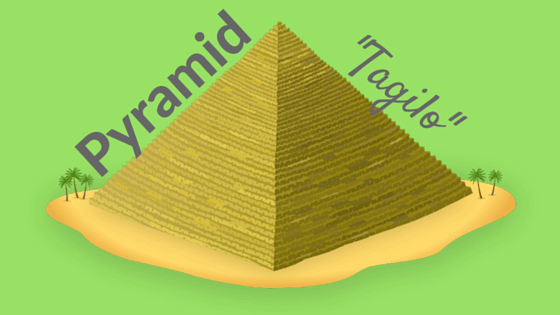 Our language, meanwhile, has three names for this shape: Tagilo, piramide, and kimos (Iloko). Dictionary definition: “Estrukturang may parisukat na pundasyon at patatsulok na gilid na nagtatagpo sa isang tuktok; anumang may ganitong hugis; solidong anyo na may polygon na pundasyon at patatsulok na mga gilid na nagtatagpo sa iisang taluktok.” (UP Diksiyonaryong Filipino, page 1202). Also known as the shape of one of history’s greatest culinary inventions–the ice cream cone. 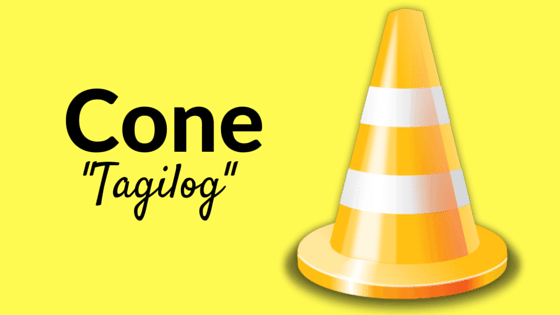 Aside from the more obvious kono (from the Spanish cono), other Filipino words for this shape are tagilog (most likely from the words tagilo or pyramid and bilog or circle), and balinsuso or balinsungsong, both of which are adjectives. Dictionary definition: “Anumang hugis apa; solido na may rabaw na bunga ng isang linya na nagdaraan sa isang pirmihang punto sa loob ng isang kurbang plane” (UP Diksiyonaryong Filipino, page 625). 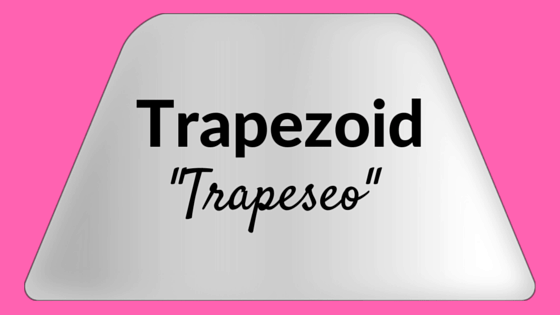 A trapezoid is similar to the parallelogram except only two of the former’s opposing sides are parallel to each other. It’s Filipino name is trapeseo, from the Spanish trapezeo. Dictionary definition: “Patag na anyong may apat na gilid na parallel ang dalawa” (UP Diksiyonaryong Filipino, page 1273). Hexagon, or eksagono in Filipino, is a shape with six sides. It belongs to a group of polygons with names that are based on the number of sides they have: pentagon, heptagon, octagon, just to name a few. Dictionary definition: “Pigurang may anim na anggulo at anim na gilid” (UP Diksiyonaryong Filipino, page 321). Although closely related, sphere and circle are two different shapes. A sphere, the best example of which is a football, is defined as a three-dimensional object. A circle (or bilog in Filipino language), on the other hand, refers to two-dimensional objects like the wheel. Dictionary definition: “Solidong heometrikong pigura na bunga ng pag-ikot sa isang bilog na lawas na ang lahat ng punto ay magkakasinlayo mula sa gitna” (UP Diksiyonaryong Filipino, page 345). 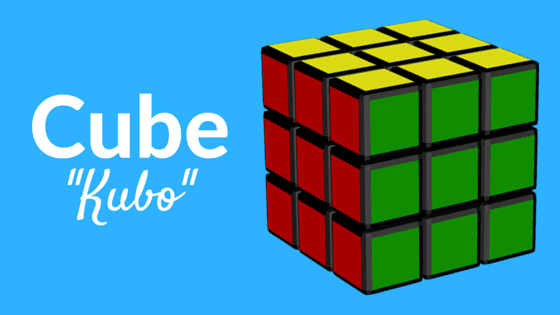 Cube, the perfect example of which is the mind-bending Rubix cube, is known in geometry as a shape that combines six square faces to form a three-dimensional object. Dictionary definition: “Bagay na solido at may anim na magkakasinlaking gilid na kuwadrado” (UP Diksiyonaryong Filipino, page 246). In geometry, a semicircle is simply 1/2 of a circle or an “open arc” just like a rainbow. 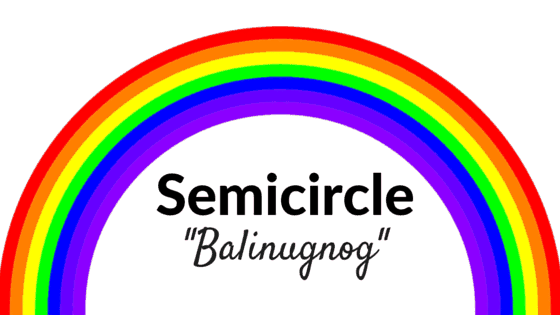 In Filipino, objects with this shape can be described as semisirkulo or the more obscure balinugnog. Dictionary definition: “Nakaayos nang kalahating bilog sa harap ng isa” (UP Diksiyonaryong Filipino, page 124). 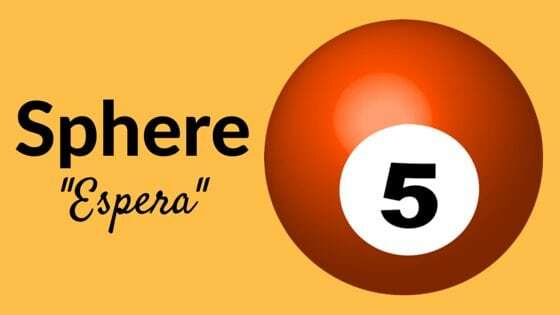 A hemisphere is 1/2 of a sphere. 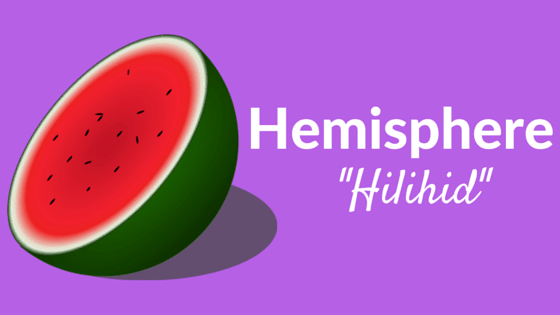 Merriam-Webster dictionary defines it as “half of a sphere or round object.” This means it can refer to the other half of the Earth, brain, watermelon, or anything round and three-dimensional. In the Filipino language, this shape is known as emisperyo (from the Spanish hemisferio) or hilihid, an old Tagalog term. 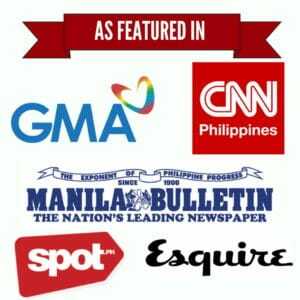 Dictionary definition: “Kalahati ng sphere” (UP Diksiyonaryong Filipino, page 442). Almario, V. (2010). UP Diksiyonaryong Filipino. Diliman: UP Sentro ng Wikang Filipino.